Twins Sera and Luke Raine’s abilities are growing. Sera is healing vampires now, making them human again. And, at times, Luke can actually change the future he Sees. Imaginable is the second book in this series. 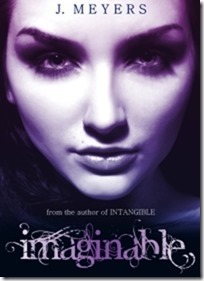 I read and reviewed Intangible (the first book) awhile back and really enjoyed it so I was happy when author J. Meyers asked me to take a look at her second book. One of the things I love best about these books in the twin connection between Sera and Luke. As far as family goes, they only have each other. They are protective of each other and their abilities. Both Sera and Luke are discovering new things about their abilities. They are becoming even more powerful and desired among the Realm which is a problem because the Realm is full of not so nice creatures. Imaginable is a fast paced book. It's full of tension and paranormal creatures. It has a full board of entertaining and endearing side kick friends. Their support and loyalty to each other is all warm and fuzzy. I read through this book fast. It seemed really short to me. I got to the end and couldn't believe I had finished already. I'm really loving this series and now the wait will begin for book 3 in this series. You can find Imaginable at Amazon. This is a wonderful series, and I also just reviewed Imaginable. I think the third will be the best one of the three as J. Meyers improves with every book! Wow! Sounds like a great series! Wonderful review and I love the nice little peek into the book!